Over to hickory as well? That is his snow meter map not his accumulations forecast. Is this a fri night/Saturday storm or Saturday/Sunday storm? I am just south of you by 20 miles and had 5.5 inches. Winter storm warning just went up for me by gsp, just south of hickory nc. 2-4 inches now. Gsp has gone wwa from charlotte up to Statesville and back to west for 1-3, and not wsw. Updated statement as of 303pm. 303 PM EST Tue Jan 16 2018...WINTER WEATHER ADVISORY REMAINS IN EFFECT FROM 10 PM THISEVENING TO NOON EST WEDNESDAY...* WHAT, Snow and black ice expected. Plan on slippery roadconditions, including during the morning commute on Wednesday.Around an inch or less of snow is expected across thefoothills, with one to three inches across much of the Piedmont. * WHERE, Portions of upstate South Carolina and piedmont andwestern North Carolina. * WHEN, From 10 PM this evening to noon EST Wednesday. * ADDITIONAL DETAILS, Be prepared for reduced visibilities attimes. Very cold temperatures surging into the area late tonightand early tomorrow morning will allow any moisture on roads toquickly freeze, so even locations that receive little snowaccumulation tonight will likely see travel problems Wednesdaymorning. Temperatures remaining at or below freezingwill result in only slow improvement in travel conditionsthrough the day tomorrow. Gsp disco Short term /Monday night through Wednesday/... as of 250 PM EST sunday: model uncertainty rears its ugly head again for the 12z cycle. The GFS has gone much weaker with the upper system driving the weather system for the middle of the week. This results in a drier forecast. The European model (ecmwf) retains its stronger and wetter forecast. The Canadian favors the GFS although slightly stronger and wetter while the NAM favors the European model (ecmwf). The sref is a mix of weak and wet while the gefs mean favors the operational GFS. This keeps the forecast uncertainty relatively high. However, our forecast continues lean toward the European model (ecmwf)/NAM Camp given the better run to run consistency of the ecwmf. That said, upper lows are notoriously tricky to forecast correctly. In addition, snow forecasts when the cold air is not already in place with a strong damming high are also problematic. Therefore, have capped pops in the good chance range where precip chances are higher. 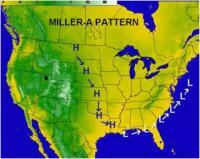 The overall pattern weather pattern remains the same. An upper low over the Great Lakes opens up and moves east as a strong short wave rotates around the low and digs a deep trough and potentially closed low across the Ohio and Tennessee valleys which moves east over or near our forecast area. The associated cold front moves east into the mountains Tuesday. As the front moves out of the mountains, a wave of low pressure forms in the Lee with an inverted trough developing. Precip moves into the mountains Tuesday with cold air filtering in behind the front. This will keep the precip mostly snow but mixing with rain in the valleys. The precip spreads out of the mountains and across the area Tuesday night. The precip remains snow across the mountains with rain changing to snow elsewhere as the cold air continues to spread in. The precip moves east through the morning Wednesday. However, low level instability develops along and east of the I-77 corridor. This will allow convective snow showers to develop before the precip moves east of the area. The best precip chances will be over the NC mountains and I-77 corridor. The western upstate and NE Georgia will see some snow showers, but any accumulations look to be a dusting at best. Using a guidance blend for quantitative precipitation forecast and snow amounts yields up to 2 inches across the higher elevations of the NC mountains and up to an inch across the I-40 and I-77 corridors. The timing of the snow showers has the potential to impact the morning commute on Wednesday. Again, this is a highly uncertain forecast and many things have to come together properly for this to develop. Gsp ice afternoon disco: Long term /Sunday night through Thursday/... as of 230 PM EST thursday: the medium range forecast starts at 00z Monday with a vigorous southern stream shortwave crossing the Southern Plains within split quasi-zonal upper level flow. Guidance has trended further south/less phased with the northern stream wave, and even closes the low off as it dips southeast toward Florida. With this track, the overall quantitative precipitation forecast trends have been lower, as convection may be more robust upstream of the low-level southwesterly flow along the Gulf Coast. The timing of precip has also been a little slower, with onset perhaps after daybreak Monday, especially along the I-77 corridor. Still, with the slower timing, Sunday night temps will be allowed to drop further into the 20s with dewpts likely in the single digits. So even with precip breaking out toward daybreak or late-morning, sfc temps will likely be sub-freezing such that whatever falls will freeze. The partial thickness nomograms from the three deterministic models generally agree on whatever falls starting out as sleet/freezing rain mix or freezing rain, then transition to rain/freezing rain late morning to midday, before turning to all rain by early aftn. With such dry air in place, despite the parent sfc high drifting well off shore, an in situ wedge will likely develop and keep temps close to freezing a bit longer than previously expected. With all this said, ice accums still look light, generally a tenth of an inch or less. But this will be enough to cause slippery Road conditions. Temps should get into the upper 30s to lower 40s by late aftn and from there stay above freezing Monday night. With the track of the low much further south and a relatively weak high building in from the north, the latest guidance has basically no northwest flow shower activity. In fact, 850 mb temps struggle to get to 0 c, so even any lingering precip may be just rain early Tuesday. But i've cut back pops, resulting in a mostly dry day. Temps will rebound to near normal with some sun breaking out by the aftn, thus ending this long cold wave. From there, the upper flow remains flat for Wednesday, but then starts to amplify with a deep trough to our west for Thursday. Cool high pressure tries to linger to our NE with moist low-level upglide starting to ramp up early Thursday. Temps should remain near normal with increasing clouds and perhaps so light precip developing within the return flow.